This morning, the TED conference brought researchers out of the lab to show off their latest gadgets — if you can use the word “gadget” to describe a hypersonic Mach 20 glider, autonomous and collaborative flying robots and a long-lasting liquid battery. It was a good lineup; the TED audience barely had time to put its socks back on before they were knocked off yet again. Better yet, probably to the delight of the investors in the audience, many of the projects are in the process of being commercialized. 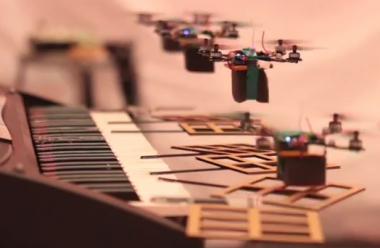 Flying robots: Vijay Kumar and other researchers at the University of Pennsylvania build robots — called “Quadrotors” — that can fly incredibly quickly and intelligently. While sensing their surroundings and movement, the robots can avoid obstacles, right themselves and carry and deposit things. Kumar showed a robot jumping through a flying hoop and drawing a 3-D map by navigating a physical space. Even better, the robots can work together with decentralized control. They can take actions based on local information while being agnostic to who their neighbors are. Kumar said potential applications for the robots include first response work and construction. Professor Donald Sadoway diagrams his liquid metal batteries. Liquid metal batteries: MIT professor Donald Sadoway is building liquid metal batteries to try to separate power supply from power demand. The goal is to help the electrical power grid do a better job of storing energy, including renewable energy. 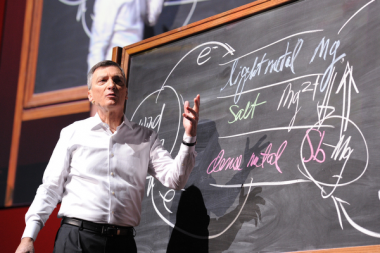 Sadoway dreamed up the idea of combining magnesium and antimony, a process he diagrammed at TED with chalk on a blackboard. Among other benefits, like cheap materials and long lifespans, liquid metal batteries are built to run hot, so they can handle temperature increases. Sadoway’s research team — which is now also a company funded by Bill Gates — has created a pizza-shaped 16-inch cell battery with a capacity of 1 kilowatt hour, and it expects to manufacture a version four times as big in two years, Sadoway said. Mach 20 flight: DARPA has conducted two tests of hypersonic vehicles, the fastest maneuvering aircraft ever built. Towed into space by rockets, both gliders crashed in the Pacific Ocean, but along the way they generated a great deal of data and more information than ever before about how to fly so fast, said DARPA Director Regina Dugan. Mach 20 speed would mean traveling from New York to Long Beach, Calif. (where TED is held), in 11 minutes and 20 seconds, Dugan said. The flight would be quick, but it would also be incredibly hot. 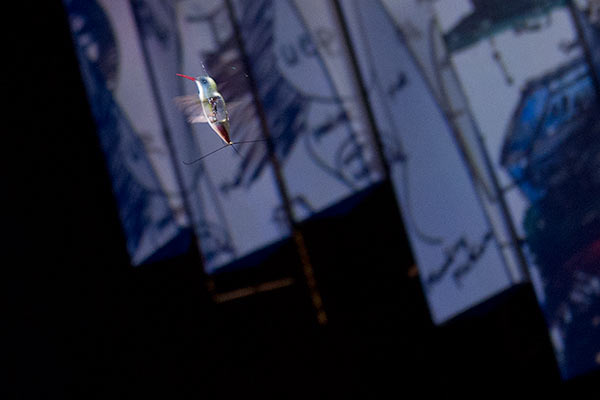 A remote-controlled hummingbird flies onstage at TED. Dugan, whose team conducts research for the U.S. military, was the surprise hit of our D9 conference last year. I imagine her TED video is going to do pretty well, too. In addition to Mach 20 flight videos, Dugan demonstrated a remote-controlled mechanical flying hummingbird, and showed pictures and videos of a nano-adhesive modeled on geckos, metals that are lighter than Styrofoam and a prosthetic hand controlled by a human mind. She might have the best bag of tricks in the business. Photos by James Duncan Davidson for TED.